As promised, here are some pics of the rest of our weekend! I really like this one:) The picture doesn't show it, but this pumpkin is super warty! Yep, we dressed the dogs up! Here's Laney-bug and Abby-saurus Rex! 1. Soak peppers in 1/2 cup boiling water until softened, about 15 minutes. Cut peppers in half and discard seeds and stem. Reserve soaking liquid. 2. In a nonstick pan, heat oil over medium-high heat. Add turkey and onion and cook until meat is no longer pink. Drain and discard fat and transfer to crock pot. 3. Blend garlic, chopped chipotle peppers and 1/4 reserved soaking water in a blender until finely chopped. Add tomatillos and remaining water and blend until smooth. Pour mixture into crock pot, add bay leaf and cumin and stir until combined. Cover with lid and cook on low for about 4 hours. 4. About 15 minutes before serving, place cilantro and 1/2 cup cold water in blender and puree until finely chopped. Stir into chili mixture. Add beans and corn, cover and continue to cook for another 15 minutes. Season with salt and pepper. Serve warm with a sprinkle of cheddar cheese and a dollop of fat free sour cream (if desired). And then I baked this Honey Walnut Pumpkin Bread that Whole Foods has been taunting me with as the recipe sat in my inbox all week! I am not exaggerating when I say Chris and I polished this off in about 36 hours flat! It's that good!! Next on the list is roasting my hubby some pumpkin seeds! YUM! oh my, sounds like you had a wonderful halloween. 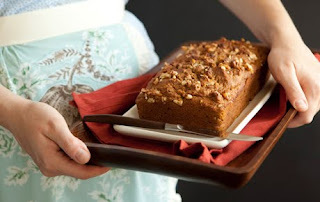 And that pumpkin bread looks absolutely delicious! I miss baking with you! Oh Lael, I miss baking with you too! Really, I miss YOU! I hope you are having an amazing adventure in New Zealand! lol i love the dog costumes. too cute! Hey kate- about how many people can I feed with that chili recipe? It looks fantastic and I'm considering making it Sunday night for my small group. But I need to feed like 15 people... Should I double or triple the recipe? Thanks for sharing it! Em ~ this recipe serves about 5 reasonably, so I would triple it. Also, I would grind up the turkey a bit more than ours to make it go further. Let me know if you decide to make it!